NEW YORK -- Cam Newton provided one of the few predictable moments, so far, in a bizarre NFL offseason. While the league's labor dispute played out in the courts, the Heisman Trophy winner was selected No. 1, as expected, in Thursday night's NFL draft, taken by the Carolina Panthers. Moments before the Auburn quarterback's name was called by Roger Goodell, frustrated fans showered the NFL commissioner with chants of "We want football. We want football." Goodell responded with a smile, saying, "I hear you. So do I." Newton led Auburn to an undefeated season and its first national championship since 1957. Carolina was 2-14 last year, using four quarterbacks, two of them rookies. 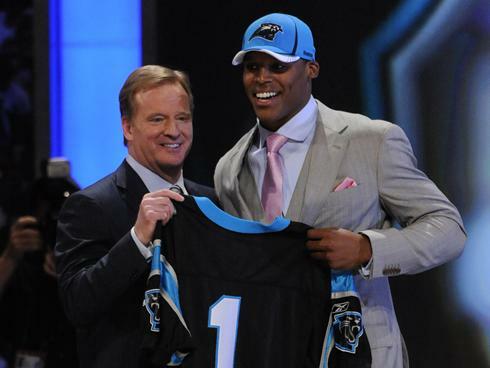 Newton's selection marked the third straight draft in which a quarterback was taken with the first pick. "It's time to get to work now," he said. The league, mired in a lockout that lasted 45 days, assured teams and players they could resume some of the normal day-to-day football operations beginning Friday. The draft was never in danger of being held because it was protected under the old collective bargaining agreement that expired in March. Moments before it began, Goodell requested a moment of silence for victims of the vicious storms that decimated part of the South on Wednesday. Hopefully, Newton will be able to shake the negative image he seems to have here in the QC and win over Panthers fans. I'm not a Panthers fan but am looking forward to seeing what Newton can bring to our city though. He can be a great role model for the kids here and there are tons of charity events that he can get involved in too.